Interviewer Asks Chris Pratt If He Was A Dinosaur Kid. Pratt's Response Was Perfect And Funny. Ah, Chris Pratt. How can anyone not love this guy. He's good-looking. He's down-to-earth. And he's too damn funny. In a recent interview wherein he talked about his movie Jurassic World, he was asked if he loved dinosaurs when he was young. It's a good question. But the interviewer's poor choice in wording the question opened up yet another portal for Pratt to sweep in with his humor. Interviewer: Were you a dinosaur kid? 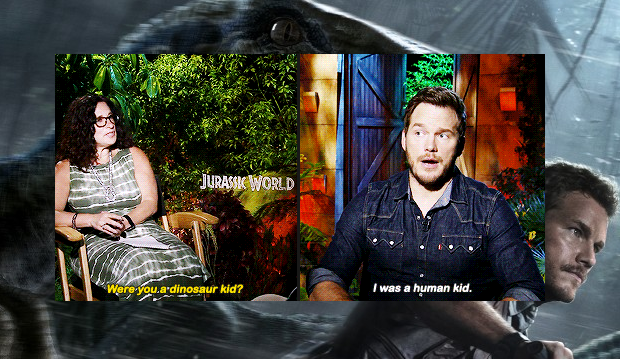 Pratt: I was a human kid. Which is different from a dinosaur kid. But as a human kid, I was interested in dinosaurs. Classic Pratt. Jurassic World is now showing in theaters near you. In it, Pratt plays a dinosaur trainer named Owen Grady. Go watch it now!